This weekend is plan, plan, plan so we’re all set to go for Thanksgiving. I can’t believe it’s almost here. Time is going so freaking fast. I shared some of my favorite gift guides this week, including my under $25 gift guide, one for her, him, beauty stuff and my favorites in the kitchen! Next week I’ll be sharing my favorite cookbooks and some kid things as well! p.s. you can also go here to get my favorite Trader Joe’s cheeseboard recipe to use for Thanksgiving! Oh my gosh. Mulled rosé! Definitely making that. I still hate the Instant Pot, but I might be making mashed potatoes in it. I’m craving this chocolate chip pecan pie like whoa. Creamed kale with hazelnut bacon crunch. What! All about the homemade holiday gifts. Tracy has the best! Chicken salad tartine toasts. Great idea for lunch. I’m obsessed with other people’s Thanksgiving menus. So many ways to roast brussels sprouts. Brilliant. Shaved brussels sprouts with apples and pecans. Give me all the brussels. Love this maple glazed spatchcock turkey! Super into this cauliflower and chicken sheet pan dinner! Potato pepperjack soup sounds so comforting. A gluten free pumpkin cream pie? OMG. 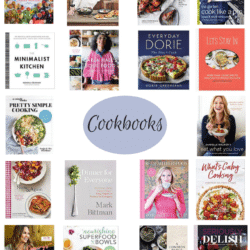 2018 Holiday Gift Guide: Cookbooks and Foodie Gifts.